It is 0545 Friday, November 11th, 2016. FPB 78-1 Cochise is 4700 nautical miles from Raiatea in French Polynesia, 6400 nautical miles from Denerau, Fiji, barely a month after leaving. Cochise has accomplished this passage for the most part directly into the wind and against the current. She has kept her crew, just three of us, rested and comfortable to the point that we have totally enjoyed the experience. And after two brief stops totaling six days – four in Raietea and two in Fatu Hiva – we are not yet ready to end this passage. Linda and I have been sharing the 0000 to 0600 watch, and our trusty crewmate Steve Parsons would usually be taking over at 0600, but our schedule has changed as we approach Panama. 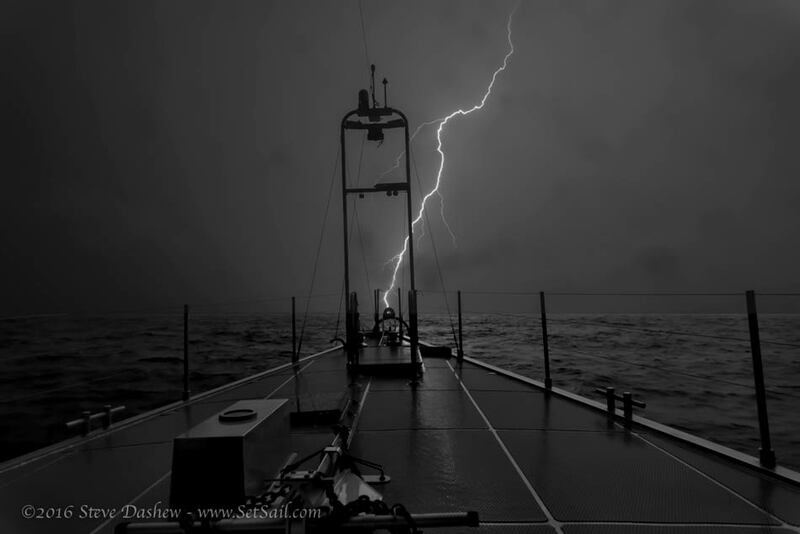 We are enveloped in shipping traffic and fishing vessels, within the bowels of a massive squall, with the added dimension of numerous cloud to water lightning strikes – as in simultaneous lightning and thunder clap. We move two VHF portable radios away from electrical connections, disconnect computers and hard drives, and remove power from iPads that back up the Simrad NAV systems. Between weather and traffic, this is not the time or place for any form of problems with Cochise. She performs as we have come to expect, the night passes, the thunder cell dissipates, and relative calm returns. Our norm during the change of watch is to have a brief discussion regarding Cochise and her systems, along with any weather, navigation, or other topics necessary for the oncoming watch to know, and then head down for a rest. This morning it is different. Nobody wants to rest. Everybody wants to feel the satisfaction of completing the voyage in a seamanlike manner, without drama or excitement. The Panamanian welcoming squall and its lightning show are taken in stride and, except for the possibility of a dramatic photo lying in wait within our cameras, is soon forgotten. The three of us are all experienced in the way of boats, their builders, and how they interface with the sea. Steve Parsons has spent most of his life as a professional sailor. His more than 250,000 miles at sea, 28,000 of which have been aboard FPBs, 50,000 in the Southern Ocean, give him a unique breadth of experience. Linda and I have a few more miles on our bodies, and have been involved with more than sixty new launches, five of which were our own, over the last four decades. We have been talking about what Cochise has just done, and the way in which it has been accomplished. Modern yachts are complex entities. They typically require a year or more to sort out after launching, and there is always a long punch list. We would never recommend to an owner that they contemplate the type of voyaging Cochise has undertaken so early in this first FPB 78’s seagoing career. And in fact, we had looked upon the voyage from New Zealand to Fiji as a quick shakedown cruise and a part of sea trials, to test Cochise in the tropics, and then planned to return to New Zealand with a punch list. After all, Cochise had been launched only ten weeks prior to our departure for Fiji. We are not on a schedule. At this point in our lives, being in our mid-seventies, Cochise is almost certainly the last new design of ours on which we will spend serious time cruising. We had no definite plans for Cochise when she was launched, other than to take some time off and enjoy ourselves. Where and when we knew would sort itself out as we got to know the boat and its abilities. Our initial plans with Cochise were a matter of our whim and this new FPB’s reliability as a brand new, first-in-class yacht. Which brings us back to the conversation we three have been having. None of us even remotely suspected we might be in Panama just five months to the day after splashing. Nothing in our joint experience, spanning dozens of yachts and well over half a million sea miles, would have suggested this was prudent, practical, or even possible. 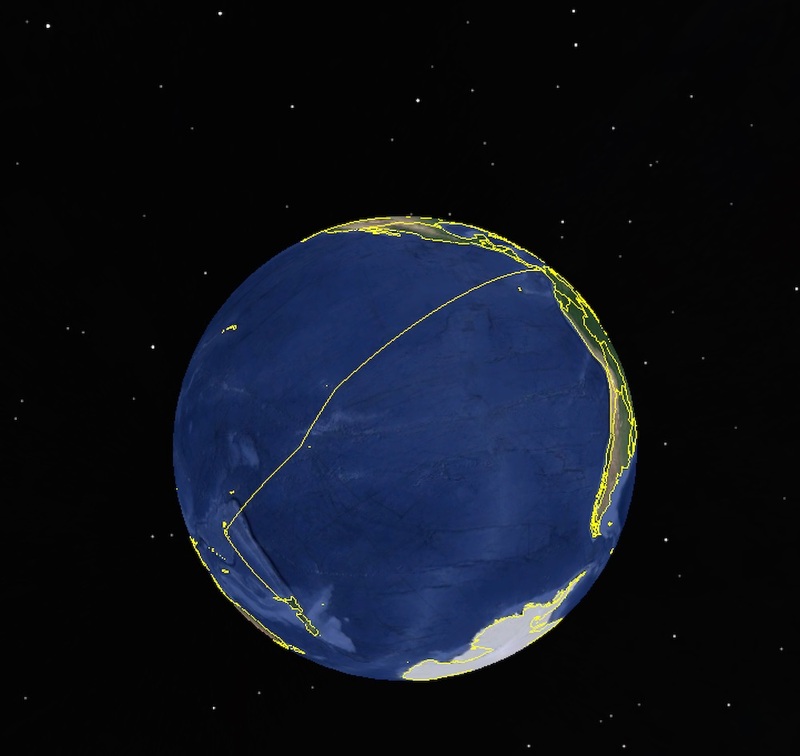 Yet here we are, almost at voyage end, well rested, and not yet ready to step onto land. Our list of system issues to date is short. We toasted half of the stator windings in one of our 250 amp Electrodyne alternators, the result of our misuse, and there was a spare aboard. We had a small but messy diesel leak in a tank inspection hatch. The Iridium Pilot Satcom system does not work, probably a hardware issue. The balance of the items are minor, mostly fine-tuning that would normally have been done on our return to New Zealand. Successfully executing new designs the first time around is a rarity in the marine business. It is difficult in the extreme. It is made more so in this case by discerning clients, with a tendency toward pursuing perfection where it is nearly impossible to achieve. We think this level of functionality and reliability so early in a new yacht is remarkable, and we would like credit to go where it is due, to Bruce Farrand and his team at Circa who have made this possible, under what have been at times sub-optimal conditions. We would also like to acknowledge the part played in this process by Sue Grant at Berthon, and Sarah Dashew at Dashew Offshore. Sue has kept everyone on track, pointed in the right direction, while looking out for the interests of all parties in a manner unique to this industry. Sarah has provided a steadying hand on the tiller, with a perspective that sees beyond the immediate. None of this would have been possible without Bruce, Sue, or Sarah’s involvement. This entry was posted on Friday, November 11th, 2016 at 1:07 pm and is filed under Dashew Logs, FPB 78, The Logs. Both comments and pings are currently closed. Congratulations, Skip. It must feel rather delightful to enjoy your new FPB with such little fanfare, stress, or worry. Enjoy your canal transit and whatever is next. Hugs to Linda. CONGRATULATIONS!!!! all around, to Steve and Linda, to Steve Parsons, to Bruce and his remarkable team at Circa, to Sue Grant, to Sarah for always being there, and to Linda Wedge and Mary Ann at Circa Marine, and Garnett who all kept the parts coming to put COCHISE together!!!! Well done!!! So proud of you all! Well done and well written. I hope folks realize what a big deal this is, not the passage itself which was relatively routine except going against the trades, but how fine tuned the boat was before leaving NZ, and certainly after Fiji. The best part is after a relatively short run up to Ft Lauderdale, tending to a short punch list will be easy and completed soon after arrival so the boat is ready for whatever you choose. That’s way cool. Congratulations on the Pacific transit! You take in stride what most of us would consider a once in a lifetime event thus reassuring us that although our individual horizons may give us pause they are in the end ultimately attainable. Enjoy and if you are ever in the Detroit area…possible “Great Loop” stopping point(? ), there is a cup of coffee (or tea) with your names on it. Safe travels! You’ve done a masterful job of redefining the cruising paradigm, definitely high time to enjoy the ride that remains. 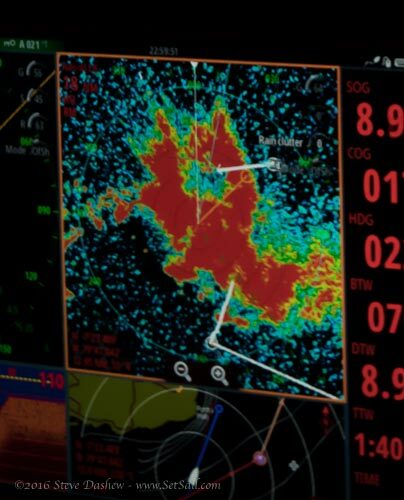 The FPB 78 looks to be the one to get you safely there and back again. I wish you well. 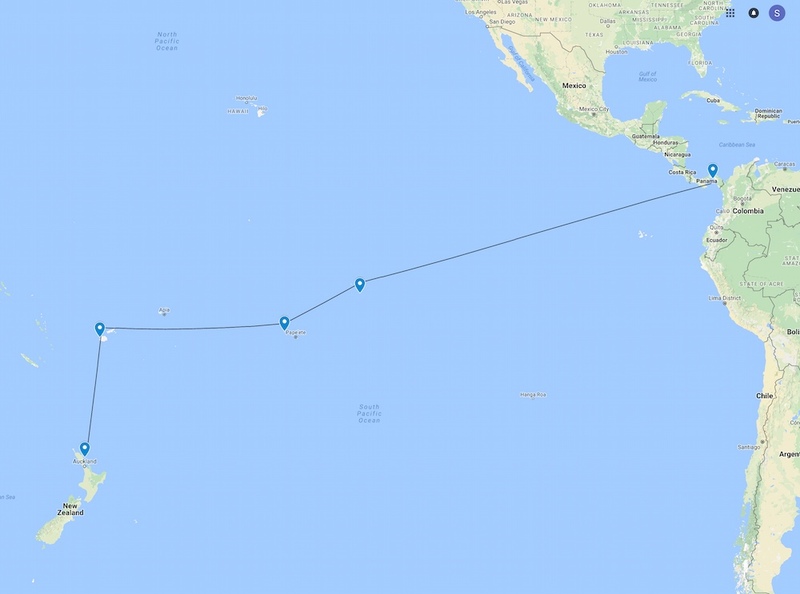 Steve, congrats to you Linda and Steve on your crossing (10 000 Nm already? Wow), also the rest of the team. As to Circa, I’ve just heard of the earth quake and subsequent tsunami on the east coast of New Zealand I hope and pray that all is well there. Congratulations on a fantastic voyage and exception vessel. Can I admit a bit of envy? If we were just transiting the canal again we would head straight for the San Blas Islands. With global warming not sure how much longer that beautiful culture will exist there. Sit back relax and enjoy one of last remaining indigenous societies.